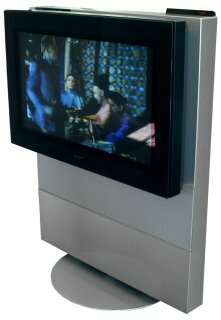 The larger Avant 32 DVD proved to be a very popular centrepiece for an elegant “home cinema” system, especially when combined with a surround sound decoder module and 4 (or 5) Beolab loudspeakers. The complete system now cost well into 5 figures, but was a very attractive option when compared to what other manufacturers were offering. Text copyright © Beocentral. Unauthorised reproduction prohibited.